Since May, I have been working in the Classics Department at Columbia University’s Avery Architectural and Fine Arts Library as a rare books intern. My work has primarily consisted of cataloguing a 6,000 item collection of American Viewbooks, so that they are available online for researchers through Columbia University Library Online (CLIO). 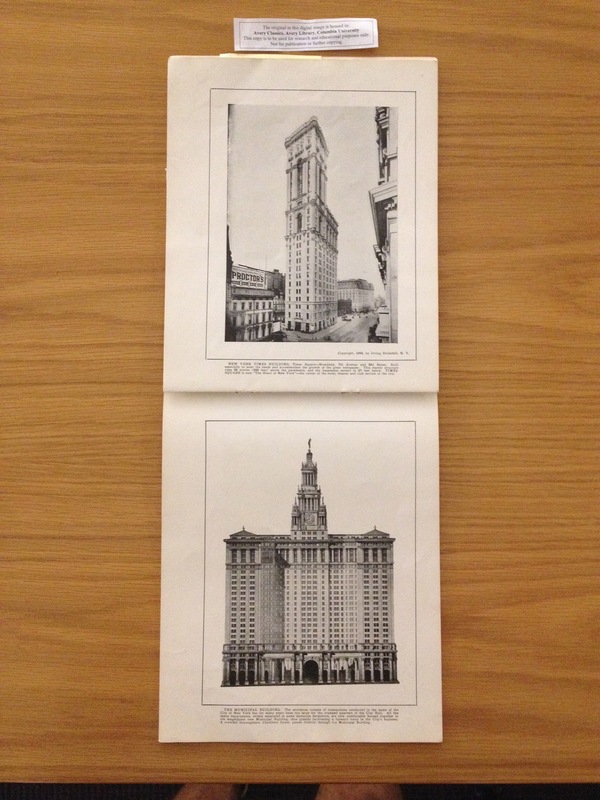 These souvenir books dedicated to American cities and towns range in publication dates, from as early as the eighteenth century up to the twentieth century, and in size, from a small brochures to large, hard-covered books of over hundred pages. In addition to providing a unique view into American vernacular architecture during this time, the books also trace important events in American history, as well as places of local significance, such as restaurants, hotels, or stores. 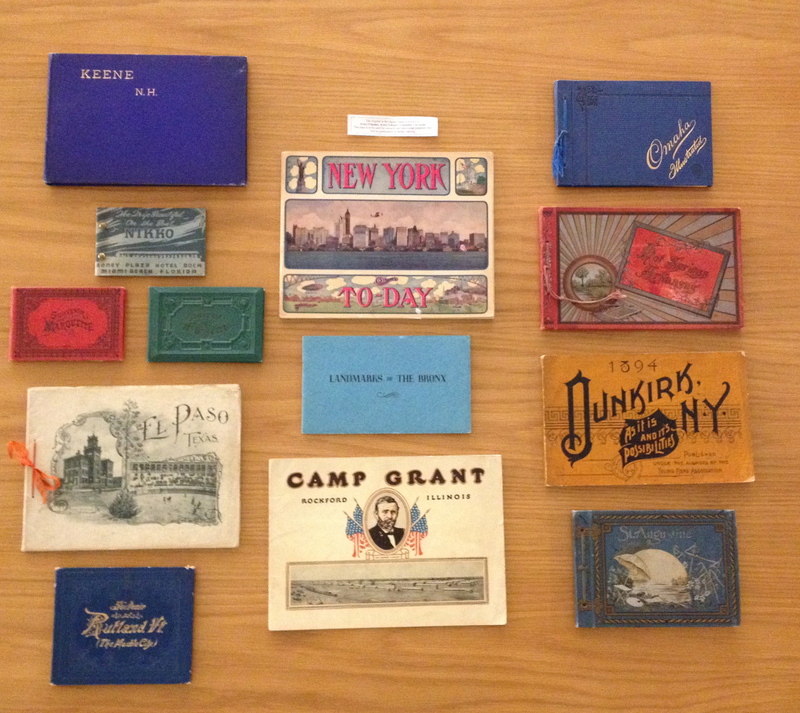 At the time of their publication, the viewbooks were used primarily for two reasons; advertising for cities and businesses, as well as souvenirs that people bought while on vacation, as evidenced through the personal notes often written inside of them. The process of cataloguing these books requires me to first input the basic information of each book (title, date, publisher, etc.) into a computer program called Voyager. From here, the process becomes more subjective, as I look through the book, reading to find key points and taking notes of important photographs of buildings, parks, people, and anything else of significance that may be helpful to researchers. With this information, I create controllable notes for each book, which allow different topics within the book to be searched for by researchers more efficiently. Finally I create a call numbers, so that the book is searchable through Columbia University Library Online. 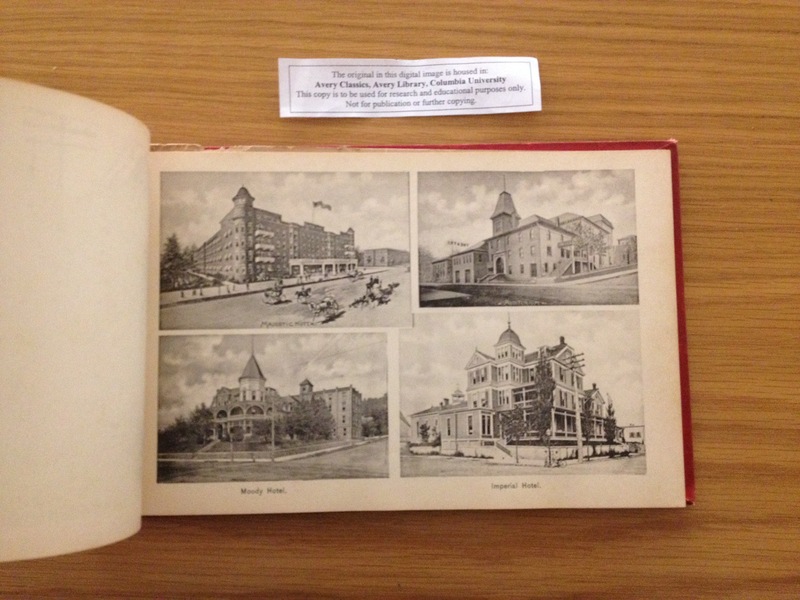 A selection of American Viewbooks, courtesty of Avery Architectural Library.